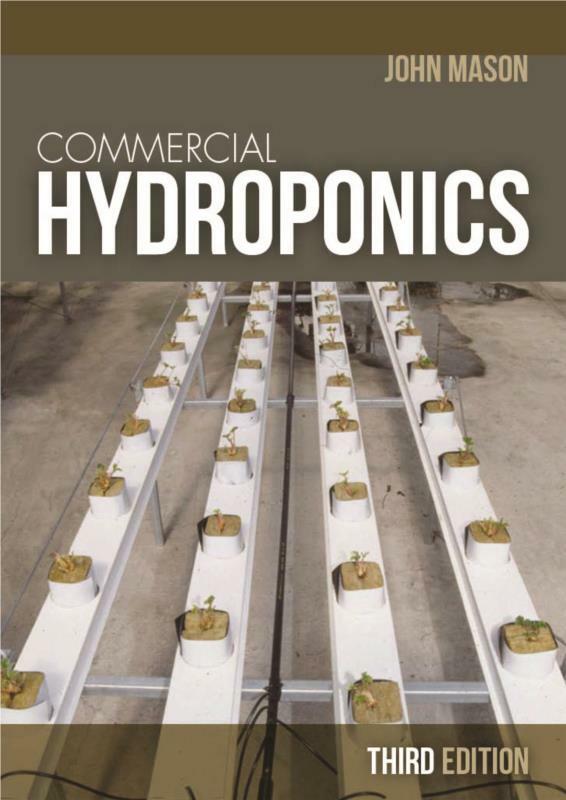 This third edition of Commercial Hydroponics is a beautifully presented, colourful, e-book and includes advice on growing an additional 16 new plants, including okra, water chestnuts, cherries, citrus gypsophila and lisianthus (those gorgeous soft purple flowers). Commercial Hydroponics has become a standard text for anyone growing plants in a hydroponic system, whether on a domestic or commercial scale. Emphasis is placed on plants that are commercially viable and ways to manage and improve crop profitability. The language is clear and concise, and a directory of suppliers is included. History; How plants grow; Classification of hydroponic systems; Overview of the industry; Why practice hydroponics? Hydroponics has a dedicated following world wide; of both amateur and commercial growers. This book, though titled “Commercial”, is still very much a relevant reference for the amateur. Over the 20 years since we published the first edition, Hydroponics has become a significant and stable facet of horticulture in many countries. It has been recognised for it’s environmental as well as commercial benefits; and an ever increasing variety of techniques and applications have emerged. Organic hydroponics is even possible today. Hydroponics offers more than anything else, possibilities for plant culture that did not exist before. In a hydroponic system, many of the manual tasks, and costs involved in soil culture can be eliminated, but there is a trade off. The set up costs are normally higher. Hydroponics can make better use of limited water resources, and can reduce or eliminate the need for chemical pest control in a commercial situation. Hydroponic produce can in fact be less tainted by chemical residues than produce from a traditional farm. I was asked to write the first edition of this book in 1988 by David Rosenberg, founder of Kangaroo Press. Despite being a relatively new branch of Horticulture, there were already plenty of hydroponic books on the market around the world. There was one thing that was still scarce in most books: information about different types of plants and how to grow them in hydroponics. A significant part of the original book was devoted to this plant information. With assistance from my staff at Australian Correspondence Schools we surveyed leading hydroponic experts and growers, interviewing them over the phone. We asked them about how to grow 87 different plants in hydroponics and then documented the results. The earlier editions have made this an exceptionally successful book, particularly being of such a specialist nature. I wish to thank all of those who have purchased and used the first editions, and I trust the second edition will be even more useful to you. This book has come together with a great deal of support and assistance from a large number of people over many years, as you will see in the acknowledgements. I wish to sincerely thank everyone who has assisted me. Needs day temperatures of 24 – 30 degrees C. Tolerates over 38 degrees C.
Requires high levels of water (i.e. needs frequent irrigations and prefers high humidity). Semi-shade may be necessary in warm climates or mid summer. pH should be around 5.5. In general, a standard nutrient solution with a ratio of approximately 4 nitrogen to 6 potassium to 1 phosphorus will give good results. Early while the plants are establishing: 2.0 mS/cm. An EC of 3.0 mS/cm has been found to reduce crop yield. Keep sodium and chlorine levels as low as possible. Over 50 ppm sodium can cause problems. Sulphur is best kept between 30 and 60 mmp. Nitrogen should be as nitrate and not ammonium. Iron is needed at higher levels (up to 3 ppm) early in the growing season, but can be reduced as the plants mature. Aggregate culture is successful in most media at 10 to 15 cm depth. Perlite has been successful in commercial production. NFT systems have also given excellent results but are not as successful as aggregate culture commercially because roots can clog the gullies and impair flow of nutrient solution. Rockwool has been used commercially in the Netherlands and the UK. Seed can be started in rockwool or sand and transplanted. Direct seeding is effective because seeds are so large. Space plants 15 cm apart. Pinch out terminal buds to encourage branching and stimulate female flower development. (Note: male and female flower are separate but on the same plant). Applications of silver nitrate and gibberellic acid will promote male flowers. Ethephon will promote female flowers. Trellising is required. Be careful tying stems as they can be brittle. Wind protection may be necessary. Diseases include powdery mildew and downy mildew, anthracnose, fusarium wilt, scab, alternaria leaf spot, bacterial wilt and several virus diseases. Pests include cucumber beetle, squash bug, leaf miner, leaf hoppers, aphis and spider mites. Once in production, a crop is picked every one to three days. Quality in terms of colour and seed size deteriorates if fruits are allowed to get too large. Cool and store between 7 and 10 degrees c on harvest (colder temperatures can damage the fruit). New mildew resistant strains are easier to grow. More compact-growing types such as apple cucumbers are more adaptable to hydroponics, though other types have been grown commercially with success.